It has been a long time since I did a book review on here so I decided to share the book(s) I'm reading now since they're pretty good. 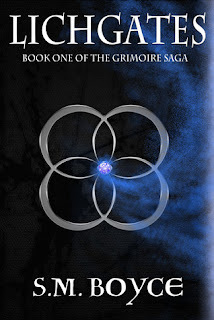 The Grimoire Saga series by S.M. Boyce is a great fantasy story. I was recommended them by one of my friends and have thoroughly enjoyed them. Her heroine, Kara, finds herself in a strange, and dark world, of the Ourea. The story begins when she comes across a strange book called the Grimoire. The next thing she knows is she is a Vagabond and must fulfill the role in order to protect the world she's from. She is hunted, tortured, and attacked, but each time she manages to survive with the help of a new friend Braeden, also an enemy of the 4 other kingdoms in this hidden land. It's full of action, adventure, new races and beasts. There is also conflict between Braeden and Kara since Braeden is falling for her and she's afraid this will only lead to more danger. I love the story-line and her actual writing is good too. I'm now reading the second in the series and looking forward to the next book. If your looking for a fun summer read, and you've already read Fable, give these books a try. If you like fantasy, you'll like these. Not much to report as far as our books go. We are still working on Fated and still plan to have it out sometime this fall. We meet with Mikey this weekend to see how he's progressing on the cover and will continue to move forward. We are about 2/3 of the way through on edits. 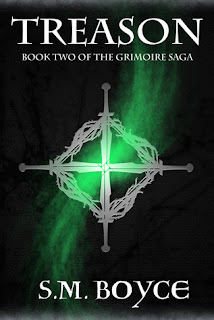 The second book in the Lorn Prophecy series, Lore, is also coming along. I have been revising it on the side, in between working on the novella, and have managed to get through the prologue and first three chapters. Hopefully it will be ready to dive right into once we are finished with Fated. We've been working hard to get these books done and published for all our fans! Don't worry, this won't be like the Game of Thrones series where you have to wait 6 yrs between books. At least that's the goal. I hope all of you have a great week and I'm hoping to do an interview with our lead character Stevie soon. Maybe Friday, we'll see. Hi Lisa, Good to hear from you. I guess everyone is busy, doing something. I met with a local film producer, who has asked me to review his script. I'll be working on it for the next three weeks. I haven't done any script doctoring for about four years. Hope I don't blow it. I was also asked to rewrite the treatment, synopsis, and log line. Whew! How is your sister? Take care. Blessings. Hi Johnny, Good to hear from you! Glad to hear you have a new project, always good to be busy! Sounds like you have your hands full, but I'm sure you will do fine. I have faith in you! My sister is fine, we have been working diligently on the books! Take care yourself! "Don't worry, this won't be like the Game of Thrones series where you have to wait 6 yrs between books." I'm certainly glad to hear that!